Gift ideas: It is an ideal gift for your child or your family at any time that you want to surprise them, matching with all occasion especially in birthday, Christmas, Party, New Year etc. 100% brand new and high quality! Soft, Comfortable, Not Itch or Irritate Skin. This Tulle Dresses is beautifully made with durable and high quality material. It is suitable for any casual/special occasions, like Parties, Wedding, Flower Girls, Brithday, Daily, Photo-shoots, Holidays etc. 5) Choose neutral detergent, try not to use alkaline detergent, alkaline detergent will make some dyes hydrolyze and fall off from clothes. 1. The recommended age is just for your reference. Please check the measurements to choose the right size for your baby! Because babies at the same age may have different height. 2. Please allow 1-3cm (0.4-1.18") difference due to manual measurement and slight color variation for different display setting. Thank you for your understanding, nice day! Knee-length,non-itchy materials with comfortable cotton lining. 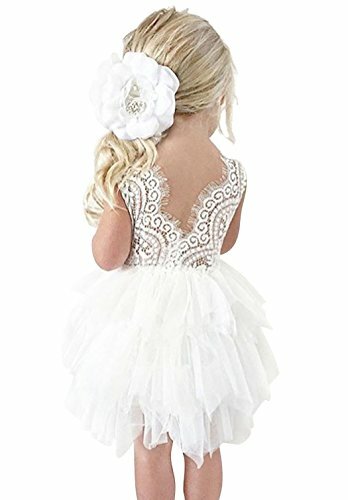 White lace tulle dress with embroidered flower detail, flower lace back. Perfect for flower girls, weddings, photo-shoots, princess parties, holiday,birthday or other special occasions. Hand wash cold,lay flat to dry.